Most people know Steve Purcell as the creator of those wacky cartoon characters Sam & Max, however I will always know him as the dude who did some of the art for The Secret of Monkey Island , and its sequel Monkey Island 2: LeChuck's Revenge . I had heard of Sam & Max, but only as a videogame put out by LucasArts, not as a comic or a TV series, so I was psyched to learn there was an animated series. Would it be as hilarious as those old LucasArts games I remember? Unfortunately, no. Or at least, not to me. Perhaps others might find this show to be one sublime half hour of comedy after another, but I just didn't get it. A few chuckles escaped my mouth in the first episode, but disappointingly, that was the extent of my pleasure while watching this show. Sam and Max are a pair of freelance detectives who refer to themselves as "freelance police". Sam is a humanoid dog that wears a suit and hat like many a detective we've seen in popular culture. His partner, Max, is a humanoid rabbit-like, doll-like creature who wears nothing but somehow manages to carry weapons with him. Together they embark on ridiculously absurd missions, most of which seem to have little to no actual storyline. Typically, it just feels as if they get a mission, do a bunch of random stuff, and then the episode ends. I believe part of this is because the universe in which they reside doesn't seem to have any consistent rules. The first episode is called "The Thing That Wouldn't Stop It" and introduces us to the characters, though the first character we meet in this episode is a little genius girl called "The Geek". Her refrigerator keeps sneaking up behind her in an attempt to eat her or something, and so she calls in repair guys to fix it, but they just keep getting eaten by the fridge, so she finally calls in Sam & Max. They determine the only way to stop it is to enter the alternate dimension located in the freezer, and once in they find the various fridge repair guys... and the monster, which was a frozen dinner that was ticked because it had been left to go bad. And how do they defeat the monster? Max eats it... because the monster wants him to do so... and then the dimension ceases to exist, kicking all inside back to the real world. After this episode, the rest are only ten minutes long (except for the final episode). That's not much time for a story, though the Spongebob Squarepants series has shown that its not impossible to do. For the second episode, we find Sam and Max at a classroom for career day when they get a call from the Commissioner about angry alien bent on destroying earth, so Sam and Max shove the entire class into the back of their car and fly it into space where they confront the alien and somehow convince him to use his powers to reheat meals in the school cafeteria. Of course, they don't show how this persuasion occurs, they just cut from a scene with Sam and Max fighting the alien (and supposedly losing) to the scene back down on earth with the conflict resolved. And it goes on and on like that. Running out of air on the moon? Just take your helmet off. Uh-oh, a meteor is heading straight for earth? Well the only thing to do is build a giant robot that can smack it away just like hitting a baseball. This series is absurd, and with absolutely no rules to constrain the events it's very hard to care about the character or the stories. I just don't get it. Maybe it's just me, but I'm sorry that I can't recommend it. On the good side, however, the art and animation is much better than I expected, especially for a TV series. I also liked Max's voice, though I wasn't too fond of Sam's. On March 11th, Sam & Max: Freelance Police!!! The Complete Series arrives on DVD, courtesy of Shout! Factory. This 3-disc set features every episode of the quirky FOX kids show, which is based on Steve Purcell’s popular underground comic. Enter into the wild world of screwy quixotic missions, jammed packed with nerve-jangling action as Steve Purcell’s popular comic book series Sam & Max Freelance Police comes to live in Sam & Max: Freelance Police!!! The Complete Series DVD box set on March 11, 2008 from Shout! Factory. Featuring collectible DVD packaging art with original illustrations by creator Steve Purcell, this 3-DVD box set contains all 13 action-packed episodes, hours of exclusive hyper-kinetic interactive bonus features and more! Sam & Max: Freelance Police!!! The Complete Series is priced to own at $34.99. The adventures of Sam & Max: Freelance Police!!! is an edgy and often irreverent animated series based on a pair of Purcell’s enormously popular underground comic. 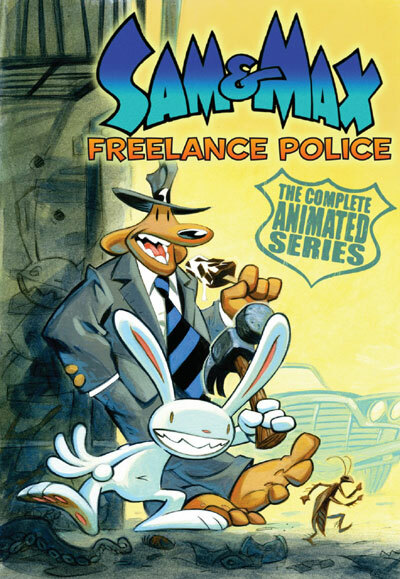 Sam is a six-foot tall anthropomorphic dog in detective clothing; and Max is a “hyperkinetic rabbity-thing.” They like to call themselves “freelance police” and often travel to different countries and the Moon to solve the most baffling crime mystery of the day. A COMIC-CONversation with Steve Purcell!! !